September 3, 2015 (Tony Cartalucci - NEO) - Political and business circles across Asia face a shifting geopolitical environment driven by the inevitable rise of China. Several fundamental factors are driving this shift that if fully understood should help established political orders, business interests, and ruling elite across Asia position themselves for a peaceful, stable, prosperous future. Failure to position oneself carefully as this shift takes place, can see a political dynasty or business empire swallowed whole in the fissures of geopolitical tectonic change. 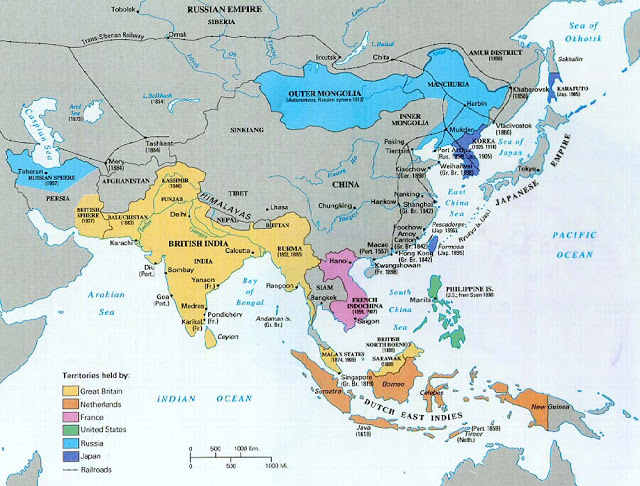 For centuries Asia was dominated by first European colonial hegemony, then for nearly a century, American hegemony. The United States itself admits that it possesses "primacy" over Asia and that its primary geopolitical objective in Asia is to maintain that "primacy." For the better part of a century, maintaining that primacy was enabled by vast economic and military disparity between Washington and the collective resources of Asia. Victory in World War 2 and America's subsequent involvement in both the Korean War and the Vietnam War allowed the United States to maintain an immense military, political, and economic footprint in the region. In the wake of the Vietnam War, however, an exhausted American Empire began its slow and inevitable retreat. In the void left by this expanding retreat, nations across the region, not the least of which is China, have built themselves up socioeconomically, militarily, and geopolitically. American efforts to contain China have proven futile - points made in the US' own policy papers who have attempted on multiple occasions to reformulate their antiquated concept of "primacy" and impose it upon Asia. The most recent of which was published by the influential Council on Foreign Relations - a corporate-funded think tank that represents the collective interests of some of the most powerful Western corporate-financier interests on Earth. The report was written by US political administrator and political lobbyist Robert Blackwill who has throughout his career played a role in grooming prospective client regimes in Asia through which the US planned to maintain its regional primacy. For those that have been approached by Blackwill and Anglo-American lobbyists like him to assist in maintaining Western hegemony in Asia, his most recent report should serve as a wake up call. The US can no longer sustain its political, economic, or military grip on Asia - and those now being asked to invest in America's failing enterprise are clearly being asked to pick a losing proposition. The Trans-Pacific Partnership (TPP) among other US-initiated trade agreements seeks to establish economic control over the region not for the benefit of any nation actually residing in Asia, but for Washington's benefit specifically at the cost of Asia. 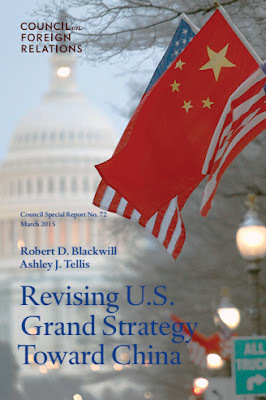 The primary objective of the United States now is to isolate China from the rest of Asia - but in the process this will deny Asia the benefit of rising with China economically, politically, and militarily in an Asia redefined for Asians. Blackwill's CFR report proposes a myriad of "solutions" to rectify America's decline in Asia - none of which can actually be implemented. Vague proposals such as to "vitalize the U.S. economy" lack any pragmatic dimensions. Others such as "strengthening the U.S. military" involve spending money that does not exist on programs that will never be approved. Other recommendations include expanding military cooperation throughout Asia - a move that would be provocative to China and would cost US partners economically both in the short and long-term. In other words, the US is trying to sell Asian players shares in its already unfolding and inevitable decline. The ruling interests in the United States fail to realize the shifting balance of power. Not only do they deny this shift is occurring, they lack any viable measures with which to adjust to it. The concept of a single corporation or handful of corporations controlling the production and distribution of the globe's automobiles, aircraft, electronic devices, and other consumer goods has been negated not only by rising economic power outside these established, primarily Western monopolies, but by the changing landscape of technology itself. In such a changing landscape where the ground shifts so quickly - monolithic corporate-financier structures built on a foundation of monopoly are like towering stone castles built on mud. They will shift, lean, and inevitably topple, crushing all those inside. China itself realizes its future is not that of the "world's factory," and is already adjusting itself not politically, but pragmatically to meet a future multipolar world - one in which nations stand more equal to one another and economic, political, military, and technical disparity is reduced. Those that adjust themselves along similar lines of pragmatism will prosper. Those who choose to invest in America's admittedly failed enterprise of global hegemony, will lose with America. The United States, not unlike empires before it, holds the allure of elitism, power, and prestige over the heads of potential client regimes. The promise of a "seat at the table" is tempting for those who place their ego before commonsense, particularly those who see the US as an avenue toward power in their respective nations. Rather than realign itself with a changing world that will not need nor tolerate American primacy in the future, the United States has doubled down on attracting the lowest common denominator in targeted nations across the world to do their bidding. For those nations turning down America's losing proposition, invitations have shifted to coercion. However, a nation that depends on forging international relations through coercion, subversion, terrorism, and the threat of war is a nation that has nothing of true substance to offer. After all, the United States would not need to convince a nation that doing business with Washington and Wall Street were in their best interest if it were truly in their best interest. In Asia, for business and political leaders who value a viable future, identifying vectors through which the US can impose its increasingly desperate policy of "primacy" over Asia, and eliminating these vectors should become a priority. Politicians and business leaders who value their egos over commonsense - or short-term promises over long-term certainty - should be involved in neither politics nor business. For those who actually believe dealing with the US will in the long term benefit them, their personal interests, or their nation and region as a whole, they need simply to read the US' own policy papers admitting their current "grand strategy" benefits none-of-the-above - and is not even benefiting the United States itself. Will Asian Leaders Choose Commonsense? The dismantling of American hegemony over Asia has already begun. Nations are systematically divesting from the United States and investing in both closer ties throughout Asia, and specifically, closer ties with Beijing. Attempts to overthrow governments across Southeast Asia, strong-arm "allies" including Japan, Korea, and the Philippines to take a confrontational tack toward Beijing, and increasingly coercive attempts to impose highly unpopular trade agreements with Asia have created considerable instability throughout the region. The entire premise of American "primacy" in Asia is that only America can bring peace and stability to the region. Not unlike a protection racket run by low-grade thugs, it appears much of the "instability" the US claims it is protecting the region from, is of its own creation in the first place. For Asia to grow and reach its true potential, to become leaders of their own region, and influential players on the world stage, they cannot afford to be burdened by the United States' antiquated notions of global empire or their increasingly disruptive attempts to maintain these notions across Asia.